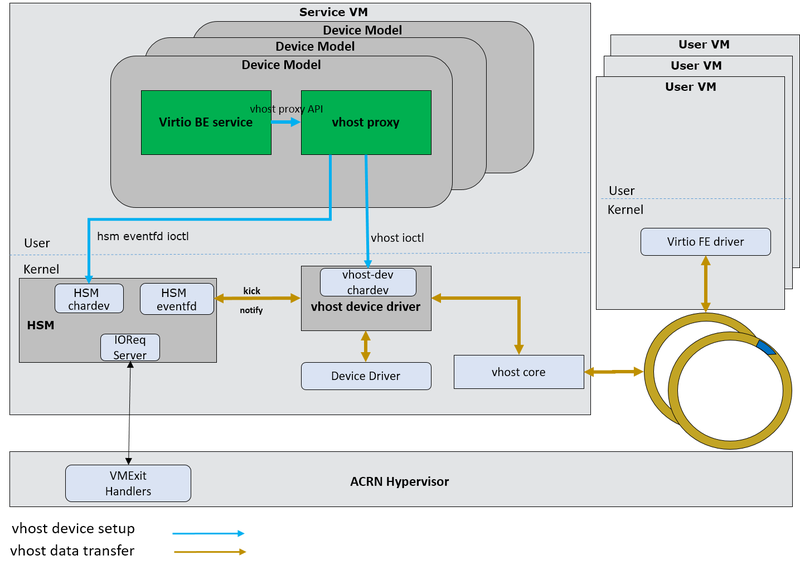 The ACRN Hypervisor follows the Virtual I/O Device (virtio) specification to realize I/O virtualization for many performance-critical devices supported in the ACRN project. Adopting the virtio specification lets us reuse many frontend virtio drivers already available in a Linux-based User OS, drastically reducing potential development effort for frontend virtio drivers. To further reduce the development effort of backend virtio drivers, the hypervisor provides the virtio backend service (VBS) APIs, that make it very straightforward to implement a virtio device in the hypervisor. The virtio APIs can be divided into 3 groups: DM APIs, virtio backend service (VBS) APIs, and virtqueue (VQ) APIs, as shown in Figure 157. DM APIs are exported by the DM, and are mainly used during the device initialization phase and runtime. The DM APIs also include PCIe emulation APIs because each virtio device is a PCIe device in the SOS and UOS. VBS APIs are mainly exported by the VBS and related modules. Generally they are callbacks to be registered into the DM. VQ APIs are used by a virtio backend device to access and parse information from the shared memory between the frontend and backend device drivers. Virtio framework is the para-virtualization specification that ACRN follows to implement I/O virtualization of performance-critical devices such as audio, eAVB/TSN, IPU, and CSMU devices. This section gives an overview about virtio history, motivation, and advantages, and then highlights virtio key concepts. Second, this section will describe ACRN’s virtio architectures, and elaborates on ACRN virtio APIs. Finally this section will introduce all the virtio devices currently supported by ACRN. 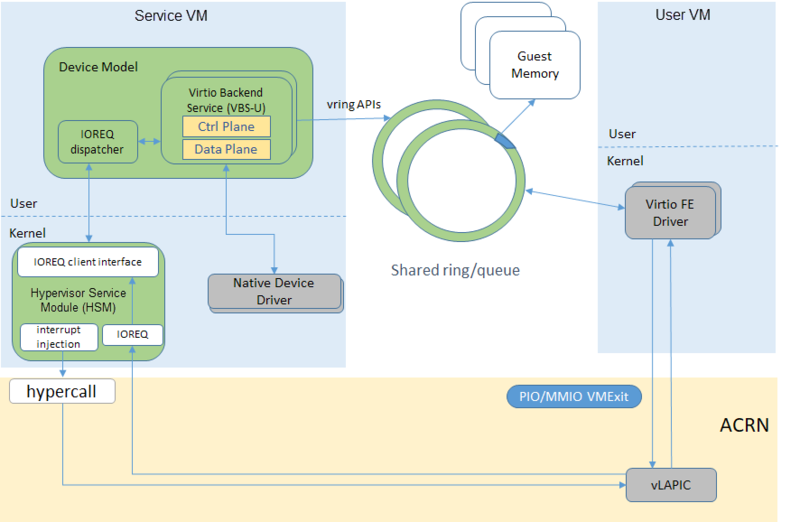 Virtio is an abstraction layer over devices in a para-virtualized hypervisor. Virtio was developed by Rusty Russell when he worked at IBM research to support his lguest hypervisor in 2007, and it quickly became the de facto standard for KVM’s para-virtualized I/O devices. Virtio is very popular for virtual I/O devices because is provides a straightforward, efficient, standard, and extensible mechanism, and eliminates the need for boutique, per-environment, or per-OS mechanisms. For example, rather than having a variety of device emulation mechanisms, virtio provides a common frontend driver framework that standardizes device interfaces, and increases code reuse across different virtualization platforms. Given the advantages of virtio, ACRN also follows the virtio specification. Virtio adopts a frontend-backend architecture that enables a simple but flexible framework for both frontend and backend virtio drivers. The FE driver merely needs to offer services configure the interface, pass messages, produce requests, and kick backend virtio driver. As a result, the FE driver is easy to implement and the performance overhead of emulating a device is eliminated. Similar to FE driver, the BE driver, running either in user-land or kernel-land of the host OS, consumes requests from the FE driver and sends them to the host native device driver. Once the requests are done by the host native device driver, the BE driver notifies the FE driver that the request is complete. Note: to distinguish BE driver from host native device driver, the host native device driver is called “native driver” in this document. Instead of creating new device buses from scratch, virtio devices are built on existing buses. This gives a straightforward way for both FE and BE drivers to interact with each other. For example, FE driver could read/write registers of the device, and the virtual device could interrupt FE driver, on behalf of the BE driver, in case something of interest is happening. Currently virtio supports PCI/PCIe bus and MMIO bus. In ACRN, only PCI/PCIe bus is supported, and all the virtio devices share the same vendor ID 0x1AF4. Note: For MMIO, the “bus” is a little bit an overstatement since basically it is a few descriptors describing the devices. Batching operation and deferred notification are important to achieve high-performance I/O, since notification between FE and BE driver usually involves an expensive exit of the guest. Therefore batching operating and notification suppression are highly encouraged if possible. This will give an efficient implementation for performance-critical devices. The virtqueues are created in guest physical memory by the FE drivers. BE drivers only need to parse the virtqueue structures to obtain the requests and process them. How a virtqueue is organized is specific to the Guest OS. In the Linux implementation of virtio, the virtqueue is implemented as a ring buffer structure called vring. The virtio specification defines three modes of virtio devices: a legacy mode device, a transitional mode device, and a modern mode device. A legacy mode device is compliant to virtio specification version 0.95, a transitional mode device is compliant to both 0.95 and 1.0 spec versions, and a modern mode device is only compatible to the version 1.0 specification. In ACRN, all the virtio devices are transitional devices, meaning that they should be compatible with both 0.95 and 1.0 versions of virtio specification. Virtio devices are commonly implemented as PCI/PCIe devices. A virtio device using virtio over PCI/PCIe bus must expose an interface to the Guest OS that meets the PCI/PCIe specifications. Conventionally, any PCI device with Vendor ID 0x1AF4, PCI_VENDOR_ID_REDHAT_QUMRANET, and Device ID 0x1000 through 0x107F inclusive is a virtio device. Among the Device IDs, the legacy/transitional mode virtio devices occupy the first 64 IDs ranging from 0x1000 to 0x103F, while the range 0x1040-0x107F belongs to virtio modern devices. In addition, the Subsystem Vendor ID should reflect the PCI/PCIe vendor ID of the environment, and the Subsystem Device ID indicates which virtio device is supported by the device. This section describes the overall architecture of virtio, and then introduce ACRN specific implementations of the virtio framework. Virtio adopts a frontend-backend architecture, as shown in Figure 159. Basically the FE and BE driver communicate with each other through shared memory, via the virtqueues. The FE driver talks to the BE driver in the same way it would talk to a real PCIe device. The BE driver handles requests from the FE driver, and notifies the FE driver if the request has been processed. 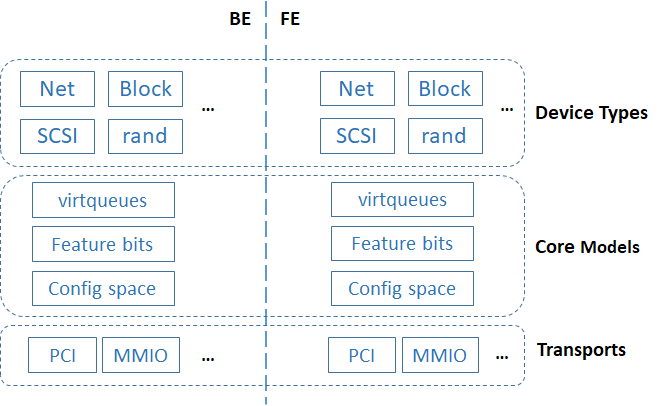 In addition to virtio’s frontend-backend architecture, both FE and BE drivers follow a layered architecture, as shown in Figure 160. Each side has three layers: transports, core models, and device types. All virtio devices share the same virtio infrastructure, including virtqueues, feature mechanisms, configuration space, and buses. 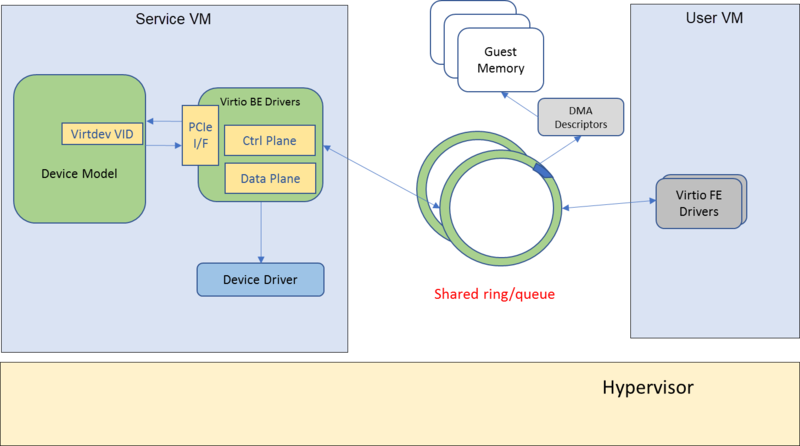 How to realize the virtio framework is specific to a hypervisor implementation. In ACRN, the virtio framework implementations can be classified into two types, virtio backend service in user-land (VBS-U) and virtio backend service in kernel-land (VBS-K), according to where the virtio backend service (VBS) is located. Although different in BE drivers, both VBS-U and VBS-K share the same FE drivers. The reason behind the two virtio implementations is to meet the requirement of supporting a large amount of diverse I/O devices in ACRN project. When developing a virtio BE device driver, the device owner should choose carefully between the VBS-U and VBS-K. Generally VBS-U targets non-performance-critical devices, but enables easy development and debugging. VBS-K targets performance critical devices. The next two sections introduce ACRN’s two implementations of the virtio framework. The architecture of ACRN user-land virtio framework (VBS-U) is shown in Figure 161. The FE driver talks to the BE driver as if it were talking with a PCIe device. This means for “control plane”, the FE driver could poke device registers through PIO or MMIO, and the device will interrupt the FE driver when something happens. 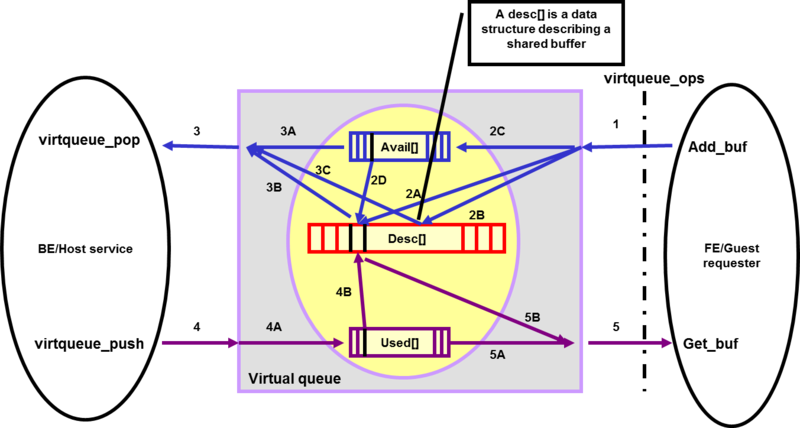 For “data plane”, the communication between the FE and BE driver is through shared memory, in the form of virtqueues. On the service OS side where the BE driver is located, there are several key components in ACRN, including device model (DM), virtio and HV service module (VHM), VBS-U, and user-level vring service API helpers. DM bridges the FE driver and BE driver since each VBS-U module emulates a PCIe virtio device. 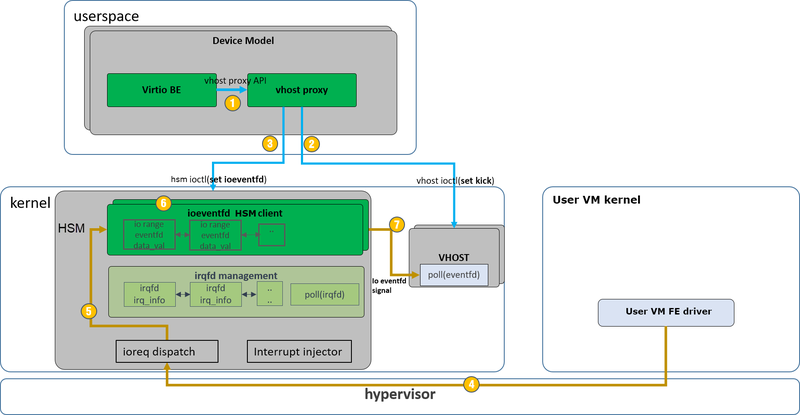 VHM bridges DM and the hypervisor by providing remote memory map APIs and notification APIs. VBS-U accesses the virtqueue through the user-level vring service API helpers. ACRN supports two kernel-land virtio frameworks: VBS-K, designed from scratch for ACRN, the other called Vhost, compatible with Linux Vhost. The architecture of ACRN VBS-K is shown in Figure 162 below. Generally VBS-K provides acceleration towards performance critical devices emulated by VBS-U modules by handling the “data plane” of the devices directly in the kernel. When VBS-K is enabled for certain devices, the kernel-land vring service API helpers, instead of the user-land helpers, are used to access the virtqueues shared by the FE driver. Compared to VBS-U, this eliminates the overhead of copying data back-and-forth between user-land and kernel-land within service OS, but pays with the extra implementation complexity of the BE drivers. Except for the differences mentioned above, VBS-K still relies on VBS-U for feature negotiations between FE and BE drivers. This means the “control plane” of the virtio device still remains in VBS-U. When feature negotiation is done, which is determined by FE driver setting up an indicative flag, VBS-K module will be initialized by VBS-U. Afterwards, all request handling will be offloaded to the VBS-K in kernel. Finally the FE driver is not aware of how the BE driver is implemented, either in VBS-U or VBS-K. This saves engineering effort regarding FE driver development. Vhost is similar to VBS-K. Vhost is a common solution upstreamed in the Linux kernel, with several kernel mediators based on it. 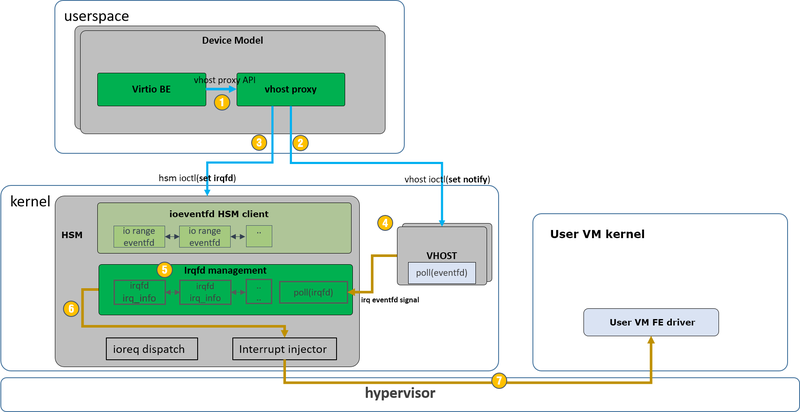 Vhost/virtio is a semi-virtualized device abstraction interface specification that has been widely applied in various virtualization solutions. Vhost is a specific kind of virtio where the data plane is put into host kernel space to reduce the context switch while processing the IO request. It is usually called “virtio” when used as a front-end driver in a guest operating system or “vhost” when used as a back-end driver in a host. Compared with a pure virtio solution on a host, vhost uses the same frontend driver as virtio solution and can achieve better performance. Figure 163 shows the vhost architecture on ACRN. vhost proxy creates two eventfds per virtqueue, one is for kick, (an ioeventfd), the other is for call, (an irqfd). Ioevenftd is bound with a PIO/MMIO range. If it is a PIO, it is registered with (fd, port, len, value). If it is a MMIO, it is registered with (fd, addr, len). Irqfd is registered with MSI vector. vhost proxy sets the two fds to vhost kernel through ioctl of vhost device. vhost starts polling the kick fd and wakes up when guest kicks a virtqueue, which results a event_signal on kick fd by VHM ioeventfd. vhost device in kernel signals on the irqfd to notify the guest. Ioeventfd module is implemented in VHM, and can enhance a registered eventfd to listen to IO requests (PIO/MMIO) from vhm ioreq module and signal the eventfd when needed. Figure 164 shows the general workflow of ioeventfd. vhost device init. Vhost proxy create two eventfd for ioeventfd and irqfd. pass ioeventfd to vhost kernel driver. ioreq is dispatched by vhm driver to related vhm client. ioeventfd vhm client traverse the io_range list and find corresponding eventfd. trigger the signal to related eventfd. The irqfd module is implemented in VHM, and can enhance an registered eventfd to inject an interrupt to a guest OS when the eventfd gets signaled. Figure 165 shows the general flow for irqfd. pass irqfd to vhost kernel driver. vhost device driver triggers irq eventfd signal once related native transfer is completed. irqfd related logic traverses the irqfd list to retrieve related irq information. irqfd related logic inject an interrupt through vhm interrupt API. interrupt is delivered to UOS FE driver through hypervisor. This section provides details on the ACRN virtio APIs. As outlined previously, the ACRN virtio APIs can be divided into three groups: DM_APIs, VBS_APIs, and VQ_APIs. The following sections will elaborate on these APIs. The key data structures for VBS-U are listed as following, and their relationships are shown in Figure 166. An example virtio device, such as virtio-blk. A common component to any virtio device. Instance of a virtual PCIe device, and any virtio device is a virtual PCIe device. PCIe device’s operation functions for this type of device. Each virtio device is a PCIe device. In addition, each virtio device could have none or multiple virtqueues, depending on the device type. 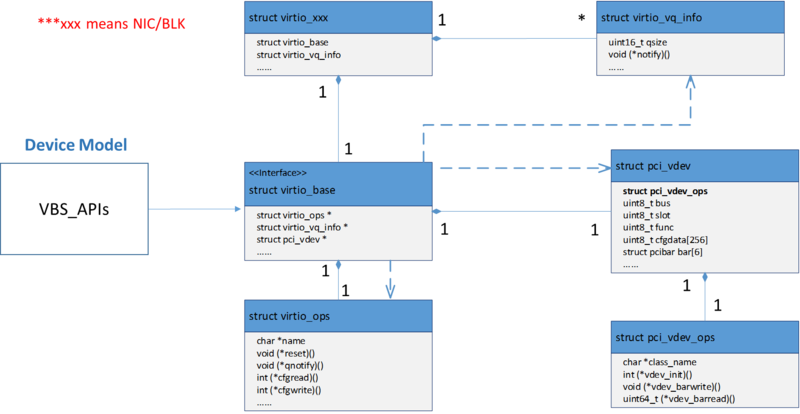 The struct virtio_common is a key data structure to be manipulated by DM, and DM finds other key data structures through it. The struct virtio_ops abstracts a series of virtio callbacks to be provided by device owner. The key data structures for VBS-K are listed as follows, and their relationships are shown in Figure 167. In-kernel VBS-K component handling data plane of a VBS-U virtio device, for example virtio random_num_generator. In-kernel VBS-K component common to all VBS-K.
In-kernel VBS-K component to be working with kernel vring service API helpers. Virtio device information to be synchronized from VBS-U to VBS-K kernel module. A single virtqueue information to be synchronized from VBS-U to VBS-K kernel module. Virtqueue(s) information, of a virtio device, to be synchronized from VBS-U to VBS-K kernel module. In VBS-K, the struct vbs_k_xxx represents the in-kernel component handling a virtio device’s data plane. It presents a char device for VBS-U to open and register device status after feature negotiation with the FE driver. The device status includes negotiated features, number of virtqueues, interrupt information, and more. All these status will be synchronized from VBS-U to VBS-K. In VBS-U, the struct vbs_k_dev_info and struct vbs_k_vqs_info will collect all the information and notify VBS-K through ioctls. In VBS-K, the struct vbs_k_dev and struct vbs_k_vq, which are common to all VBS-K modules, are the counterparts to preserve the related information. The related information is necessary to kernel-land vring service API helpers. The key data structures for vhost are listed as follows. The DM APIs are exported by DM, and they should be used when realizing BE device drivers on ACRN. Convert guest physical address to host virtual address. NULL on convert failed and host virtual address on successful. ctx: Pointer to to struct vmctx representing VM context. gaddr: Guest physical address base. len: Guest physical address length. Set virtual PCI device’s configuration space in 1 byte width. dev: Pointer to struct pci_vdev representing virtual PCI device. offset: Offset in configuration space. val: Value in 1 byte. Set virtual PCI device’s configuration space in 2 bytes width. val: Value in 2 bytes. Set virtual PCI device’s configuration space in 4 bytes width. val: Value in 4 bytes. Get virtual PCI device’s configuration space in 1 byte width. The configuration value in 1 byte. Get virtual PCI device’s configuration space in 2 byte width. The configuration value in 2 bytes. Get virtual PCI device’s configuration space in 4 byte width. The configuration value in 4 bytes. Assert INTx pin of virtual PCI device. Deassert INTx pin of virtual PCI device. Generate a MSI interrupt to guest. Generate a MSI-X interrupt to guest. index: MSIs table entry index. The VBS APIs are exported by VBS related modules, including VBS, DM, and SOS kernel modules. They can be classified into VBS-U and VBS-K APIs listed as follows. These APIs provided by VBS-U are callbacks to be registered to DM, and the virtio framework within DM will invoke them appropriately. The VBS-K APIs are exported by VBS-K related modules. Users could use the following APIs to implement their VBS-K modules. Each VBS-K device will be registered as a VHM client, with the information including “kick” register location, callback, etc. Destroy the client corresponding to the VBS-K device specified. This API is normally called in the VBS-K device’s callback function, to get value write to the “kick” register from frontend. This IOCTL is used to get the supported feature flags by vhost kernel driver. This IOCTL is used to set the supported feature flags to vhost kernel driver. This IOCTL is used to set current process as the exclusive owner of the vhost char device. It must be called before any other vhost commands. This IOCTL is used to give up the ownership of the vhost char device. This IOCTL is used to convey the guest OS memory layout to vhost kernel driver. This IOCTL is used to set the number of descriptors in virtio ring. It cannot be modified while the virtio ring is running. This IOCTL is used to set the address of the virtio ring. This IOCTL is used to set the base value where virtqueue looks for available descriptors. This IOCTL is used to get the base value where virtqueue looks for available descriptors. This IOCTL is used to set the eventfd on which vhost can poll for guest virtqueue kicks. This IOCTL is used to set the eventfd which is used by vhost do inject virtual interrupt. This IOCTL is used to register/unregister ioeventfd with appropriate address, length and data value. This IOCTL is used to register/unregister irqfd with appropriate MSI information. The virtqueue APIs, or VQ APIs, are used by a BE device driver to access the virtqueues shared by the FE driver. The VQ APIs abstract the details of virtqueues so that users don’t need to worry about the data structures within the virtqueues. In addition, the VQ APIs are designed to be identical between VBS-U and VBS-K, so that users don’t need to learn different APIs when implementing BE drivers based on VBS-U and VBS-K.
Below is an example showing a typical logic of how a BE driver handles requests from a FE driver. All the BE virtio drivers are implemented using the ACRN virtio APIs, and the FE drivers are reusing the standard Linux FE virtio drivers. For the devices with FE drivers available in the Linux kernel, they should use standard virtio Vendor ID/Device ID and Subsystem Vendor ID/Subsystem Device ID. For other devices within ACRN, their temporary IDs are listed in the following table. The following sections introduce the status of virtio devices currently supported in ACRN.